Groups can and do change their formation or name from time to time, but following the 2014 European Parliament elections, there are currently seven groups. And there are rules to adhere to: each group must have at least 25 MEPs from a minimum of seven member states. There are also a number of MEPs who do not belong to any group, known as non-attached members (or the non inscrits in EU jargon). In total, 186 national parties are currently represented within the European Parliament, a slight increase on the previous term. This is the biggest group in the European Parliament, yet one from which British MEPs are absent. This used to be the home of the British Conservatives before they left to set-up a more Eurosceptic group. Along with the Socialist group, the EPP has traditionally been one of the two powerhouses of the Parliament, providing most of the Presidents, Vice-Presidents and Committee chairs. It is broadly centre-right and enthusiastic about deeper EU integration. The chair of the group is Germany's Manfred Weber. 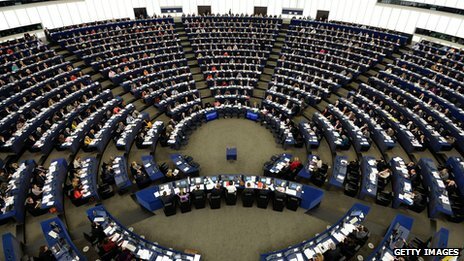 It is the main centre-left group in the Parliament, and for many years was the biggest group in Brussels, although that crown has since been taken the by the EPP. Along with the EPP it tends to provide the lion's share of top jobs in the Parliament. One of the big winners of the 2014 elections, the group rose to third place, despite a drop in support for one of its biggest components, the British Conservatives. The origin of this group can be found in David Cameron's desire for the Conservatives to leave the federalist European People's Party and set up a new right of centre and Eurosceptic group at the time of the 2009 elections. Alongside the Conservatives, the biggest delegation is Poland's Law and Justice Party, and the group also contains - among others - the Ulster Unionists and Alternative for Germany. Broadly centre-right and eurosceptic it contains a mixture of groups that are more social conservative and those that promote economic liberalism. The main centrist group in the Parliament, ALDE saw its overall numbers take a hit at the 2014 elections, mainly due to the sharp fall in support for its two biggest components, the British Liberal Democrats and the German Free Democrats. Sinn Fein provides the sole UK representative in this group. The group's full name represents the fact that it traditionally it has contained left-wing environmentalist groups from Scandinavia. As its name suggests, this group is an alliance of two parties - the European greens, and the European Free Alliance, which primarily represents parties focused on regional interests such as the SNP, Plaid Cymru, and Catalan parties. The group generally takes a left of centre position on most issues, and - naturally - this is the home of the UK's three Green Party MEPs. Traditionally the most Eurosceptic group, the EFDD contains MEPs who attack the idea of European integration from a broadly - but not exclusively - right wing perspective. The UK provides the largest number of MEPs in this group, containing as it does the 24 MEPs from the UK Independence Party, with the 17 MEPs from Italy's Five Star Movement in second place. Often a thorn in the side of the "Brussels establishment", the EFD group has two co-presidents, UKIP's Nigel Farage, and David Borrelli from the Five Star Movement. And so to those MEPs who have not been able to find enough friends or allies to form a group of their own, or who have been rejected by other groups. Many non-attached members come from right-wing parties such France's Front National, and Hungary's Jobbik. However it also contains MEPs who feel they do not fit into any of the other groups, such as the Democratic Unionst Party's sole MEP. Being unattached means that members have much less access to speaking time in the chamber, as well as fewer administrative and secretarial resources.